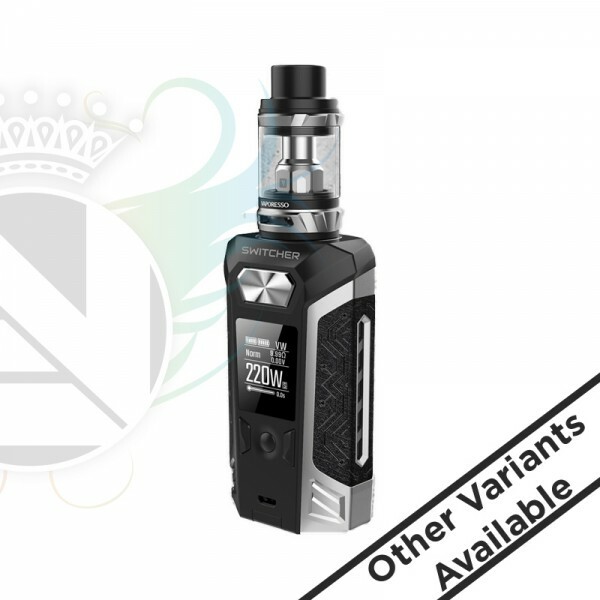 Vaporesso Switcher 220W Kit with the up-to-date OMNI Board 2.6 chipset, features the simplest operation with the newest addition of graphical virtual keys, "Unlock" button, puff number statistics and high power protection function for small power atomizer. The Switcher mod bringing fun back into vaping with its all metal case that is removable and replaceable, creating different looks that you like with a variety of colours and prevision covers. Optional lighting version (Switcher LE BLUE/RED) will make your vaping bright and fun. It features 0.96 inch OLED screen, power dual 18650 (Not supplied) and max 220w output. The strong and sturdy 510 interface holds the Vaporesso NRG mini tank (2ml TPD Compliant) secure and presents the power while the leather hand grip brings an outstanding feel.